Do you want to load 2D or 3D data? 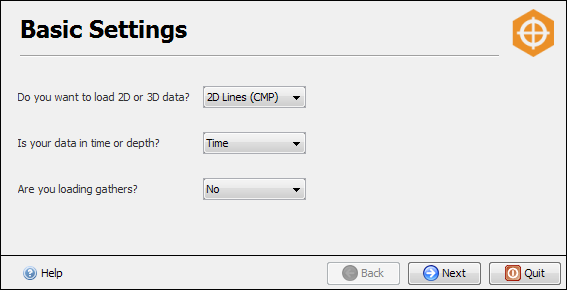 — Select 2D Lines (CMP). Is your data in time or depth? — Select Time. Note: You should select the actual vertical dimension of the data in the SEG-Y files as the SEG-Y Loader does not perform any time/depth conversion. Time/depth conversion however can be done in Insight (see Converting Time-Depth). If your actual data is in depth, then select Depth. Are you loading gathers? — Select No because you are loading single traces data. If data is gathers, you can select Yes - Offset, Yes - Angle, Yes - Frequency or Yes - Channel based on the gather dimension of the data. Click Next once you have defined the basic settings.